While flipping through that vast picture catalog, Pinterest, I stumbled upon a Williams Sonoma recipe that caught my eye. No, it wasn’t gluten free, nor dairy free, and certainly not vegan, but it looked so tempting. Of course, I had to give it a try, for my family’s sake. No, not for me (wink, wink). During the fall season I roast pumpkin in large batches and freeze quart containers because the season feels so short to me. Like the amount of time in a day, it’s never enough! Between work, kids, errands, etc. you just need to unwind on a weekend afternoon with a hot beverage and a big slice of cake. And what could be better than some pumpkin, some pecan, and some streusel? Some chocolate! Yes, chocolate, it goes SO well with pumpkin. Williams Sonoma’s cake had a vanilla icing but I felt we needed some chocolate. We always need some chocolate. With all the anti-oxidants in dark chocolate it can’t be too sinful, right? I added banana to the batter for added texture, it also makes for a great binder in vegan baking. Though we are not vegan I do end up making some recipes vegan. Being that we are already dairy free, in addition to gluten free, taking out eggs makes for some vegan baking that you would never know is vegan. My husband cannot tolerate a lot of egg yet my twin boys need to eat more egg yolk. I know, it can make a girl go nuts. They certainly keep my wheels spinning. 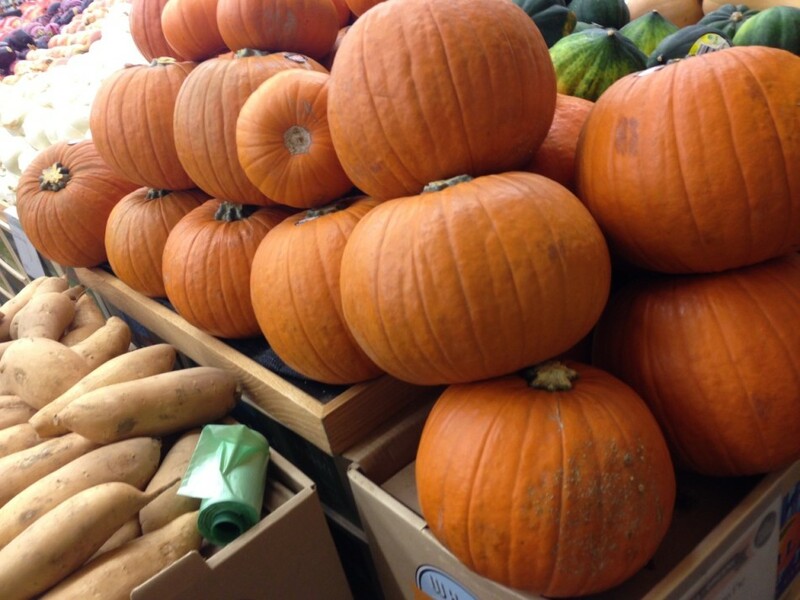 Pumpkin, banana or squashes are perfect for converting into vegan recipes because they bind the wet and dry ingredients well. I find chocolate desserts difficult to make vegan, I have tried a few and they always came out tasting like something was missing. That does not get my stamp of approval so I am still working on those. On a side note: I was at the car wash yesterday and saw this frame that just made me chuckle. It spoke to me with the intensity of a bullhorn. Words well said…so anyways, back to the cake. What I loved about this cake was how moist and rich it was yet not heavy at all. So moist. Can you see that? And yes, I pour that chocolate on like nobody’s business. 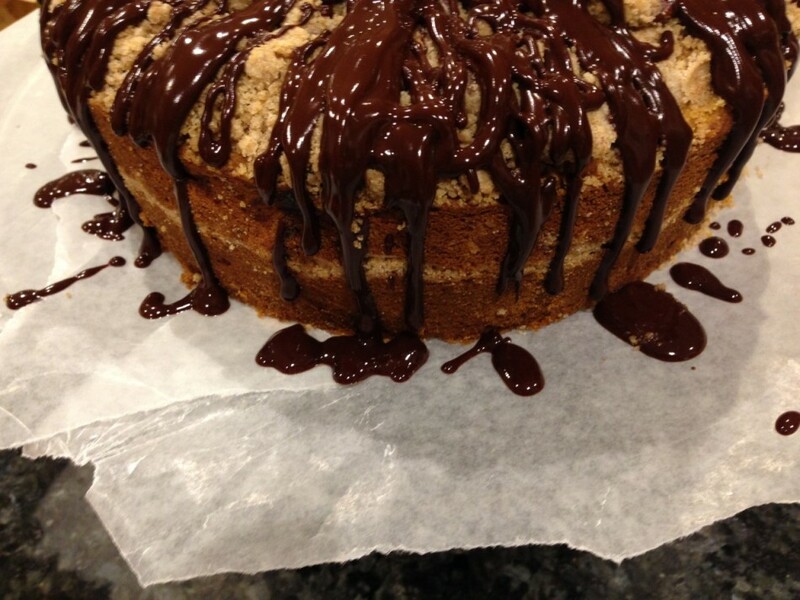 Those bits of chocolate and streusel crunch had me at OMG. It’s one of those desserts where you just don’t want to be faced with the last bite. Where you know the end is near, but you need more. Yep, it’s one of those. If you are thinking about what to bake for Thanksgiving, and don’t want to make a standard pumpkin pie, well, I must tell you this creamy spiced cake with the chocolate covered crunch will definitely impress your loved ones. I couldn’t wait for Thanksgiving, you will understand when you take your first bite. Enjoy! Preheat oven to 350°F. Grease and flour a 9-inch spring form pan or a 9-inch cake pan with 3-inch sides (recommended by Williams Sonoma). I used an Angel Food Cake Pan. Combine the flours, brown sugar, cinnamon and kosher salt in a small bowl. Add Earth Balance Soy Free Spread into the dry ingredients. 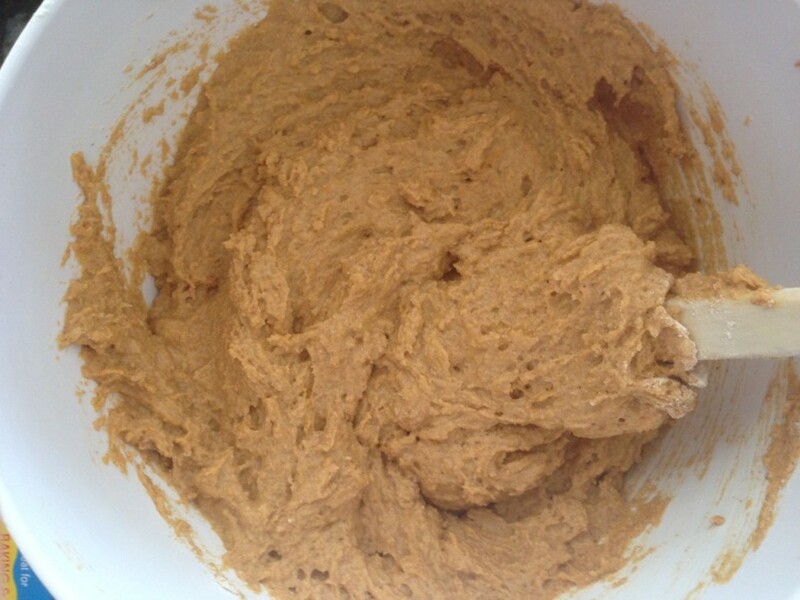 Work the spread into the mixture with your hands until the mixture looks like coarse crumbs. A mini chopper just won’t do it. You will end up with a paste, so work those muscles! Stir in the pecans (with a spoon now). Set aside. Measure your coconut yogurt then add the apple cider vinegar to it. Let it sit without mixing to become “sour-creamy” looking. Set aside. In a medium bowl, sift together, or whisk the flours, baking powder, baking soda, cinnamon, ginger, nutmeg and kosher salt. 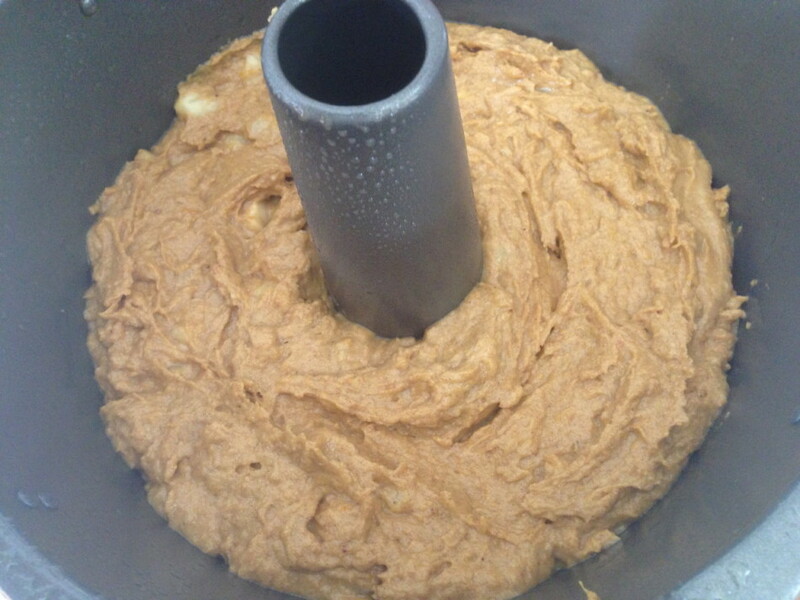 In the bowl of an electric mixer fitted with the flat beater, beat together the butter and brown sugar on medium-high speed until well combined. Add the mashed banana, scraping down the sides of the bowl with a rubber spatula when needed. 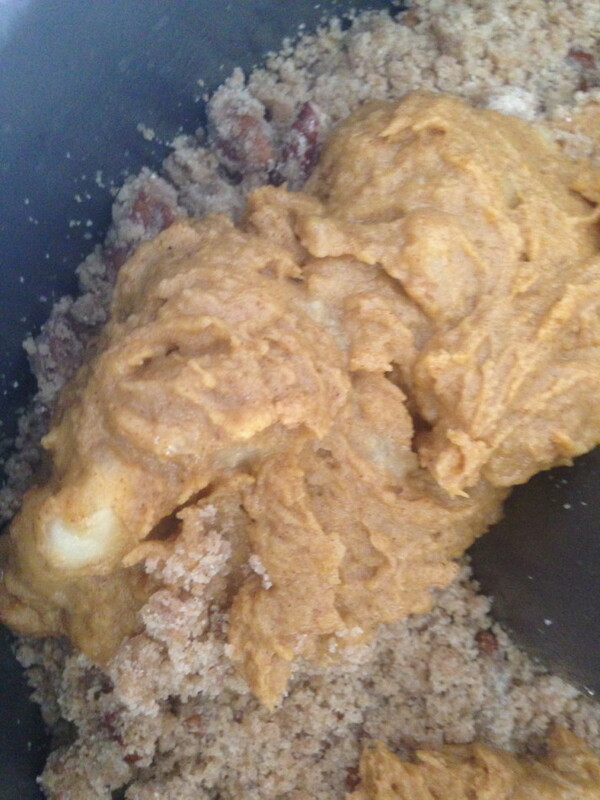 Add the pumpkin puree and “sour cream” mixture and continue to mix on low speed. Add in the flour mixture. The batter will be quite thick which is how it should be. Note: If your batter is not thick for some reason then add 1/4 cup of white rice flour. Spread half of the thick batter into the prepared pan. 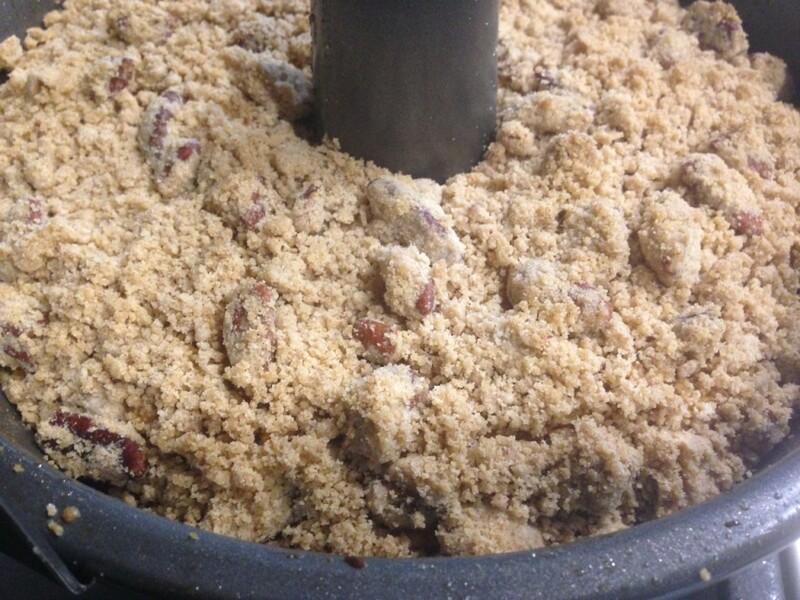 Sprinkle half of the streusel over the batter. Add the remaining batter over the streusel and spread the thick batter evenly. Then evenly spread the remaining streusel over the batter. Bake 50-55 minutes, or until a toothpick inserted into the center of the cake comes out clean. Transfer the cake in the pan to your stovetop and let it cool for about 40 minutes. When cooled, remove the sides of the cake from the pan using a spreader type knife, or something that will not scratch your cake pan, then gently lift up the cake by pressing the removable bottom upwards. I then refrigerated the cake with the bottom part still holding the cake for about an hour. I felt the cake might fall apart if I try to lift it off the center piece, and so that the chocolate glaze will firm up nicely on the chilled cake. Transfer the chilled cake to a cake platter. Put pieces of wax or parchment paper under the edges of the cake to keep the glaze drips from making a mess of your pretty platter. In a glass bowl set over a small saucepan with simmering water, combine mini chips with Earth Balance spread. Note: The saucepan should only be about a third full of water, and the glass bowl sitting over the saucepan should not touch the water at all, even during the simmering stage. You will see some condensation bubble on the bottom of the bowl which is fine. Mix often to get a glossy sheen. When completely melted take off the saucepan and let it cool for 5 minutes before glazing. Using a large spoon drizzle melted chocolate over the top of the cake. Slowly pull out the papers along the cake. Cut into thick slices and serve. Makes one 9-inch cake. Serve chilled (my preference), or room temperature. Will refrigerate well for up to 3 days double wrapped in plastic wrap or in an airtight plastic container. This I have to try, you put all my favorites in! 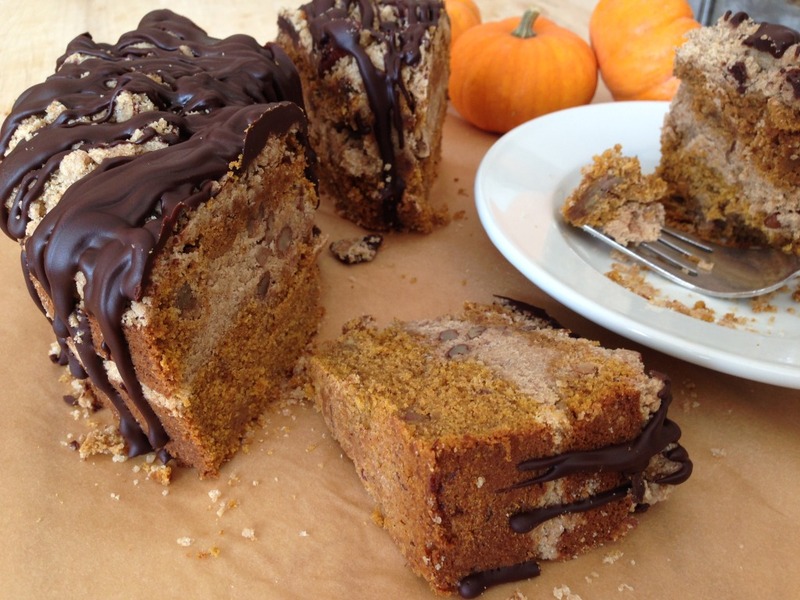 pumpkin, chocolate and pecans wow it looks uh-mazing! Gosh this is just what I have been looking for! I will attempt to roast pumpkin, but keep a can on hand just in case. I can't wait to try this!!! 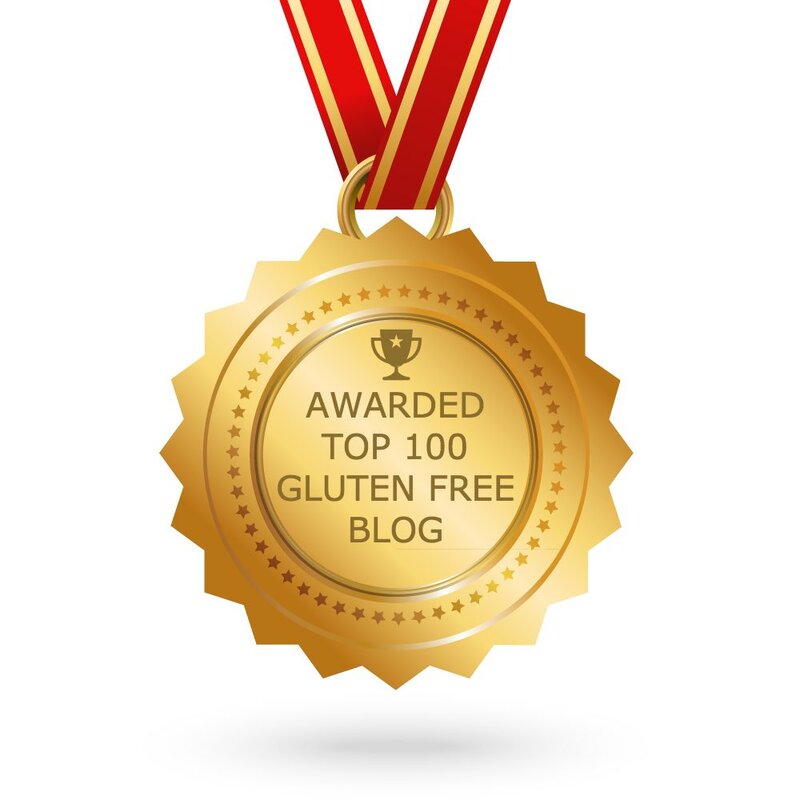 Si glad I found your blog because this vegan recipe, also soy free looks delicious! I know what I'm making Thanksgiving dessert with my roasted pumpkin. Thanks! I am excited to try this recipe but I cannot eat oats. What do you suggest I replace it with? I suggest substituting with sorghum flour. Enjoy! I will clarify this on the post, thank you for the great question Laney! The saucepan should only be about a third full of water, and the glass bowl sitting over the saucepan should not touch the water at all, even during the simmering stage. You will see some condensation bubble on the bottom of the bowl which is fine. The idea is that the chocolate not get too hot or it will burn. Enjoy! this is like your new bundt recipe's twin sister! It kind of is. 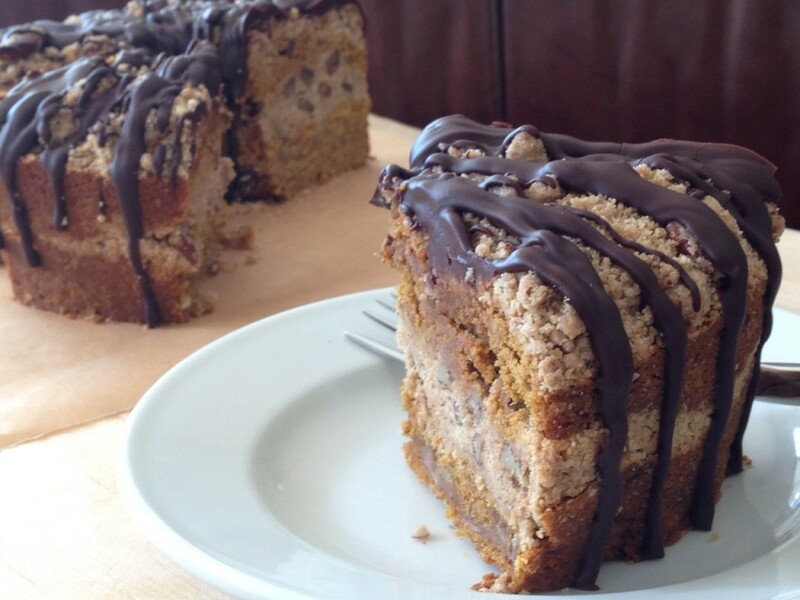 Add nuts to my spiced pumpkin bundt, and they are like two peas in a pod! I am drooling over this cake!!! Jessica, I took a chance on this recipe and made it for my son's holiday party (he is vegan) and it was a hit. Everyone loved the sweet pecan crunch and many commented how moist and delicious it was for a gluten free and vegan cake. I was thinking the same thing. Thank you for this recipe I will be making this again.